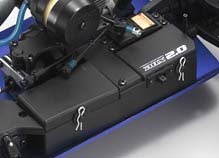 The size of an 1:8 scale nitro buggy on a huge diet gives the new DBX 2.0 some incredible performance! 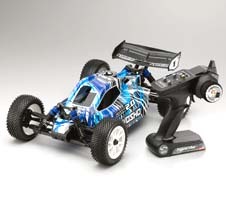 Built for the beginner racer and performs like a world class 1:8 scale buggy. Take advantage of all the great things that make a 1:8 scale buggy then make it lighter, smaller and tighter and this is what you get. An .18 nitro powered (GXR18SP) buggy that runs for 10 minuets on a tank of fuel while giving .21 1:8 buggies a run for the money in performance all for a fraction of the cost. Design features like suspension arms that are the same on all 4 corners (keeping spare parts to a minimum) and a new 2.4GHz radio (no more worries about what TX channel you are on) make this one of the most exciting beginner Nitro RC cars of all time! Friendliness of a 1/10 combines with powerful 1/8 performance. A new 18-size engine buggy launches a new era in off-road sports. 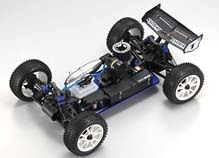 Closer in size to the 1/8 INFERNO than existing 1/10 GP buggies (it even uses 1:8 scale tires and wheels), this advanced chassis design promises real racing performance while still being easy to drive. The stable handling lets you power through the dirt even on 1/8 buggy racing circuits and takes on big jumps without missing a beat. With running power that pushes the boundaries of common sense for a 1/10 class machine, you can turn local open space into your own private rough road race track. The deep stroke 4-wheel independent suspension and full-time 4WD drive-train powered by the 18-size engine means nothing can stand in your way. Fully-factory assembled and in a Readyset package for instant off-road excitement. 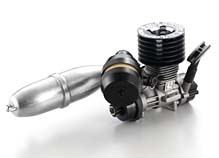 Large capacity Big Bore oil shocks as standard. Soaks up bumps with ease and secures smooth jump landings. Features dial adjustable chassis height setting. Brake disks Front and Rear of the center differentials providing reliable braking power. 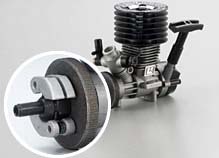 Enables separate adjustment and setting of front and rear brakes. Pre-cut and decaled body features Cab-Forward design for great looks and tuns of downforce. 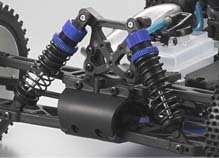 Multi-point chassis setup adjustments such as chassis height, camber, tread, front and rear toe-in etc. 1:8 Scale tires and Wheels are used on the kit and any 1:8 scale tires and wheels fit the 17mm Hex hubs. This gives you an exceptional variety of tire choices! 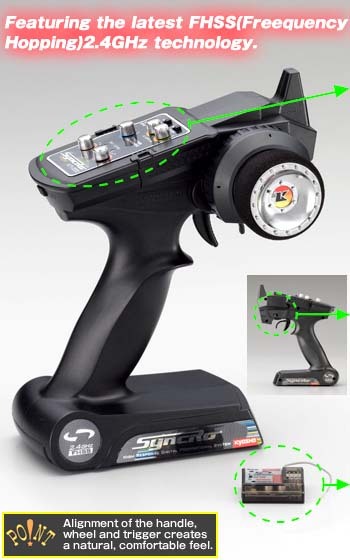 Digital Servos - for great response and control. Power House GXR18SP mounted on 1/10 chassis that is normally seen with 12-15 size engines. Equipped with recoil starter, large cylinder head and tuned type muffler. Long 1/8 class wheelbase delivers incredibly stable performance. The flat finish of the countersunk chassis leaves no screw heads protruding and is easily maintained. 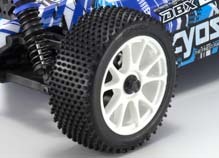 10-spoke 1:8 wheels and Kyosho micro square patterned tires deliver both style and rigidity. Both come from the 1/8 class Inferno series. The Dirt-proof radio box for the receiver and battery can be removed from the chassis with just four screws for easy maintenance. A large capacity 103cc fuel tank to feed the 18-size engine delivers a stable fuel supply even under severe driving conditions with run times of more than 10 minutes. 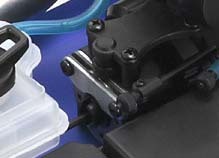 Flly interchangeable suspension arms, front knuckles and shock stays keep the spares count low. Equipped with newly designed maintenance-friendly ball connected suspension system. Racing style 2-shoe clutch delivers snappy performace. The Cab forward design of the body delivers optimal down force and airborne stability as well as increasing maximum speed. Printed body requires no painting. The trim, EPA and servo reversing settings are located on the top panel of the radio for easy access, visibility, and to prevent accidental changes by bumping, knobs normally located on the front of other radios. 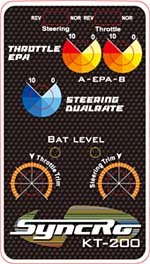 The advanced nature of this design is ideal for beginners and intermediate drivers. The advanced receiver design features four channels, which allows for future development and expansion. It also includes a fail-safe feature that will maintain control of your vehicle in the rare event of signal loss.